William Julius Wilson is Lewis P. and Linda L. Geyser University Professor at Harvard University. He is one of only 20 University Professors, the highest professional distinction for a Harvard faculty member. After receiving the Ph.D. from Washington State University in 1966, Wilson taught sociology at the University of Massachusetts at Amherst, before joining the University of Chicago faculty in 1972. In 1990 he was appointed the Lucy Flower University Professor and director of the University of Chicago's Center for the Study of Urban Inequality. He joined the faculty at Harvard in July of 1996.
received 42 honorary degrees, including honorary doctorates from Princeton, Columbia, the University of Pennsylvania, Northwestern, Johns Hopkins, Dartmouth, and the University of Amsterdam in The Netherlands. A MacArthur Prize Fellow from 1987 to 1992, Wilson has been elected to the National Academy of Sciences, the American Academy of Arts and Sciences, the National Academy of Education, the American Philosophical Society, the Institute of Medicine, and the British Academy. In June 1996 he was selected by Time magazine as one of America's 25 Most Influential People. He is a recipient of the 1998 National Medal of Science, the highest scientific honor awarded in the United States, and the Talcott Parsons Prize in the Social Sciences by the American Academy of Arts and Sciences in 2003. 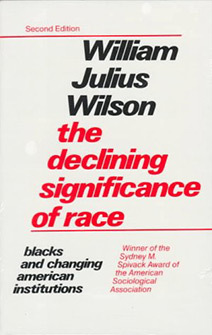 He is the author of numerous publications, including The Declining Significance of Race, winner of the American Sociological Association's Sydney Spivack Award; The Truly Disadvantaged, which was selected by the editors of the New York Times Book Review as one of the 16 best books of 1987, received The Washington Monthly Annual Book Award, the Society for the Study of Social Problems' C. Wright Mills Award, and the Aaron Wildavsky Enduring Contribution Award (along with When Work Disappears) from the American Political Science Association; When Work Disappears: The World of the New Urban Poor, which was selected as one of the notable books of 1996 by the editors of the New York Times Book Review, received the Sidney Hillman Foundation Award, and the Aaron Wildavsky Enduring Contribution Award (along with More than Just Race) from the American Political Science Association; The Bridge Over the Racial Divide: Rising Inequality and Coalition Politics. More recently he is the co-author of There Goes the Neighborhood: Racial, Ethnic, and Class Tensions in Four Chicago Neighborhoods and Their Meaning for America; Good Kids in Bad Neighborhoods: Successful Development in Social Context. His latest book, More than Just Race: Being Black and Poor in the Inner City. Other honors granted to Wilson include the Seidman Award in Political Economy (the first and only non-economist to receive the Award); the Golden Plate Achievement Award; the Distinguished Alumnus Award, Washington State University; the American Sociological Association's Dubois, Johnson, Frazier Award (for significant scholarship in the field of inter-group relations); the American Sociological Association's Award for Public Understanding of Sociology; Burton Gordon Feldman Award ("for outstanding contributions in the field of public policy") Brandeis University; the Martin Luther King, Jr. National Award (granted by the Southern Christian Leadership Conference, Los Angeles); and Professor Wilson is a member of numerous national boards and commissions, and was previously the Chair of the Board of The Center for Advanced Study in the Behavioral Sciences and of the Russell Sage Foundation.